I’m excited to be baking for this year’s Will Bake For Food sale. It’s the second year in a row that Jenny Miller (Rainy Day Gal) and Jenny Richards (Purple House Dirt) have organized this blogger bake sale for hunger here in Seattle. This year’s charity is the Emergency Feeding Program of Seattle and King County. Seattle is home to an extraordinary number of food bloggers and there will be some incredible talent on display. Molly Orangette is baking. CakeSpy created the event logo. Herbivoracious, Not Without Salt, and Seattle Food Geek are all participating along with many more whose food, writing and photography I admire. I’m a little intimidated, but one thing I’ve learned this year is when the food community comes together, great things (Charcutepalooza, A Pie for Mikey), happen. I know I’ll meet some fun people and I’m certainly going to eat well. But why make cookies? 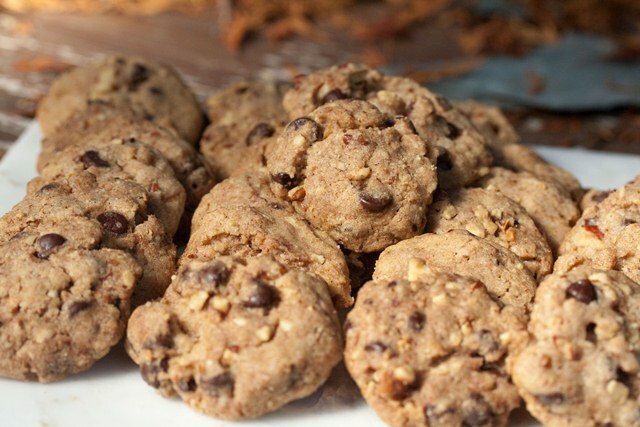 Any baker can attest that cookies rate high on the hassle scale. Mixing the dough isn’t the issue; it’s baking them off – sheet after sheet after sheet – as I am doing today. But when I think of abundance, and food security, two things I am lucky enough never to have done without in my life – I think of cookies. I remember coming home from school and finding fresh baked cookies cooling on the bread board. One of the best things in life and a memory I wish were a part of every kid’s childhood. 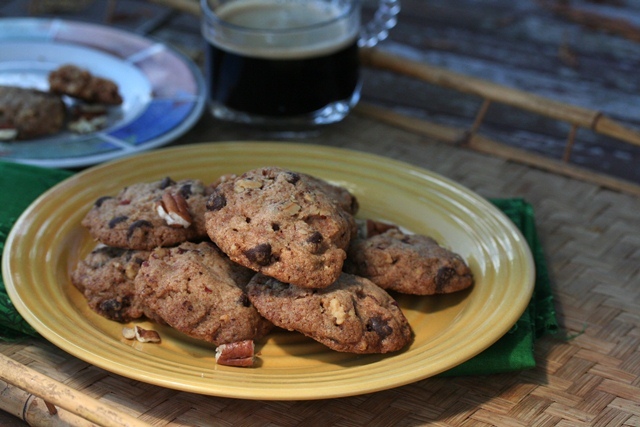 The recipe I am using is one I make often: Chocolate Chip Espresso Shortbread Cookies. I adapted it from the formula used at a bakery I worked at right out of college, where I learned how to mass produce cookies with as little pain as possible. 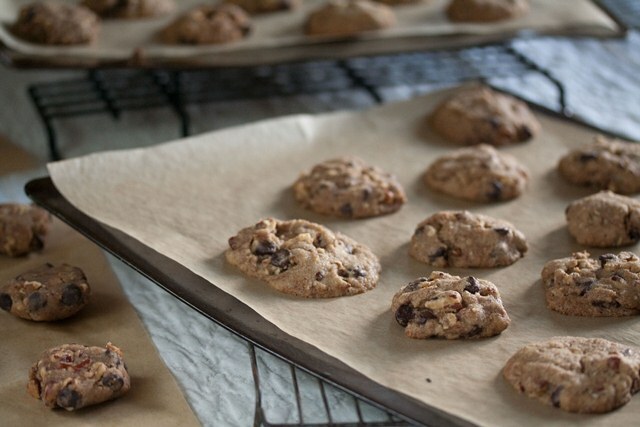 Mix the dough one day, scoop on to parchment paper the next, and always, always time your cookies in the oven and keep them under close surveillance. Otherwise you’ll be writing, editing photos, or cleaning the bathroom and your cookies will turn to sad, blackened, hockey pucks. The sale is on Saturday, November 12, from 11am to 2pm, (or until the goodies are gone – which happened early last year) at the University Heights Center, at 5031 University Way NE – just a stroll away from the University Farmers market. I won’t lie – parking is going to be a nightmare, but it will be worth it – in addition to all the tempting bake sale fare, there’s going to be raffle, with some pretty awesome prizes – and it will make such a the difference to the Emergency Food Program, with the holidays only a few weeks away. Bring a non-perishable food item or two; check out the program’s most needed-food list, or plan to make a cash donation on site at the sale. Me too! I’m a Tacoma native – your blog is really lovely. Great, great post!! You took all of that crazy information and stitched it together quite nicely. Maybe you should volunteer to draft our press release next year! See you Saturday – bake well!